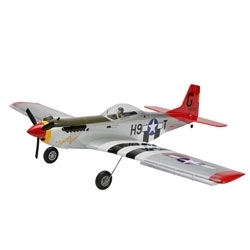 Hangar 9’s P-51 Mustang Mk II PTS is perfect for the entry-level pilot. PTS™ stands for Progressive Trainer System—making this an airplane that will allow you to go from training to advanced sport maneuvers without upgrading or purchasing a new plane. Once you’ve mastered the basics with the help of a flight instructor, simply remove the NACA droops and advance to sport maneuvers. This Mustang Mk II PTS also comes ready-to-fly so there’s nothing left to build. And it has incredible scale detail. The included Spektrum™ DX6i is a 2.4GHz DSM2™ 6-channel programmable computer transmitter designed to provide freedom from frequency restrictions and interference. With a variety of features, the DX6i is a radio system that’s perfect for the student pilot, and just like the plane itself, can grow with the modeler. Also included with the Mustang is Evolution® Engines’ no-fuss Trainer Power System. It’s ready to start right from the box with no tuning or lengthy break-in period necessary. The P-51 Mustang Mk II PTS—the new standard in first class.